I Want Be Part Of The Dine ‘N Dish Challenge! Dine ‘N Dish With Words to Sweat by and Around the Plate! 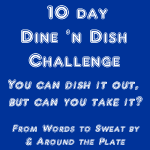 The Dine ‘N Dish challenge officially starts today! For those new to the concept, here is reasoning behind the Dine ‘N Dish Challenge. It’s so straightforward, it might seem silly to hold a challenge, even – but now with everything back in full swing – school (for people of every age) and all the activities that come with it, old habits creep right back into our day-to-day. So simple meal prep and planning changes that you can integrated into your routine now will mean healthier eating when it’s dark at 4 PM (or at least feels like it) and cooking is the last thing on your mind. This is all about rollover ingredients. Plan out your meals for the week and while making one meal, prep some additional ingredients to use in another meal during the week. The ability to pull something already cut/prepped out of the fridge will make you more likely to use it since it will require little-to-no effort to include it as part of your meal. Kristina LaRue from Love and Zest. The challenge officially launches today and ends on October 21st to give you the opportunity to think about how to approach the challenge before jumping in and then have 10 consecutive days to complete the challenge so that the habit has time to take root. Grab a button (below) for your blog to let people know you’re participating. You must leave a comment on this post, the official challenge start post, saying you intend to participate. The challenge ends at midnight PST on October 21st. A winner will be selected using a random number generator October 24nd and the name of the winner will be announced on the Words to sweat by blog. This contest is open to residents of the US and Canada. Void where prohibited. 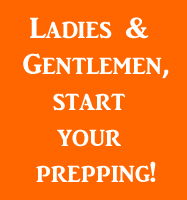 The Dine ‘n Dish Challenge: Get Your Prep On!